After reaching two of our 2020 environmental goals early, Accenture worked with key stakeholders to define the next chapter of our environmental journey. In December 2018, we announced our new Science-Based Target, approved by the Science-Based Targets Initiative, to reduce our absolute greenhouse emissions 11 percent by 2025 against our 2016 baseline. To date, we are the largest professional services company to make this type of commitment. To meet our target, we will work to develop responsible solutions for further sustainable growth and intensify our focus on the efficiency of our business operations. This includes reducing our energy use and switching to renewable forms of power, as well as addressing air travel impact and supply chain sustainability. A decade into our quest to lessen our environmental impact, thinking—and acting—green is part of daily life at Accenture. We are helping to accelerate the shift to a low-carbon economy and to lessen the effects of climate change. 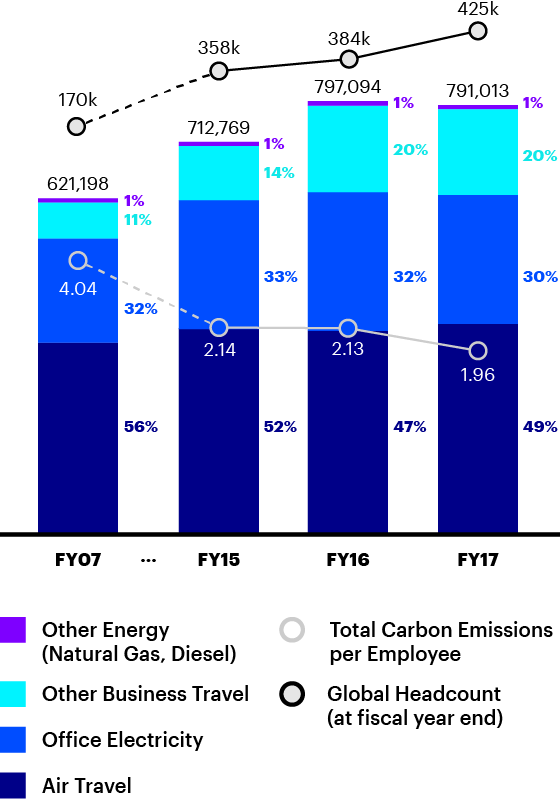 Since setting our initial carbon target, we have reduced our carbon emissions per employee by more than 52 percent against our 2007 baseline. Hover over the bars in the chart to view a percentage breakdown of our carbon emissions by year. Our people help drive our progress. They have embraced digital technologies and innovative solutions as a way to lessen our collective environmental impact. Explore the tabs below and click on each icon to learn how our global eco commitment makes a difference in communities worldwide. Accountability for our environmental strategy starts at the top and cascades to our governance bodies, which oversee our environmental policy and corporate objective of fostering environmentally sustainable growth. Our Environmental Responsibility Policy, established in 2007, is reviewed annually. Accenture Broadcast produced 3,000 live-stream events in fiscal 2017, including all-employee broadcasts, Telepresence conferences and external events. With 19 fully equipped pop-in studio locations globally, we make recording video communications accessible across key Accenture offices. How are new technologies helping us conserve energy? We are working with key stakeholders, including the Science Based Targets initiative, to define the next chapter of our environmental strategy. We are committed to doing our part to keep global warming well below 2°C. How are we taking our environmental strategy to the next level? Virtual training, widespread use of collaboration technologies, and our delivery model enabled us to save an additional US$97M travel costs and avoid an additional 14,000 metric tons of carbon compared to last year. How are we lessening travel to reduce carbon emissions? We focus on finding new ways to apply technology and invention to create a positive and lasting impact for people and communities. Our 2017 Corporate Citizenship Report explores our goals, progress and performance across our global operations during our most recent fiscal year.